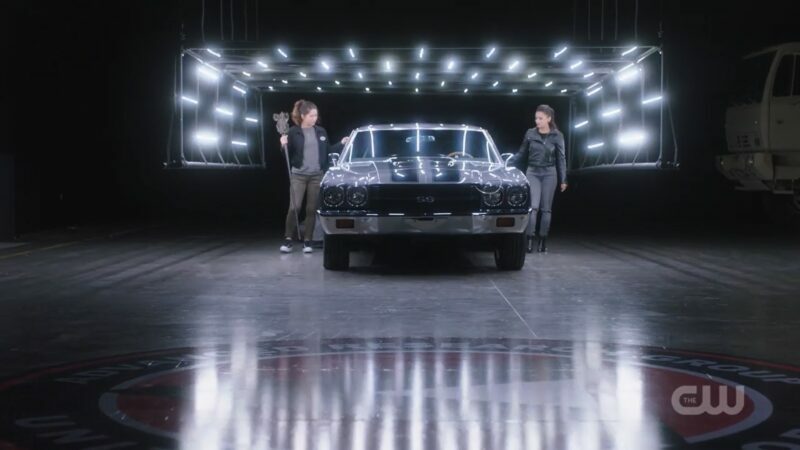 Joss Mardon (Reina Hardesty) and Raya Van Zandt (Gabrielle Walsh) check out the S.A.M – Stealth Automobile. Image courtesy of The CW. After the fun trip to Gotham City with Green Arrow and Supergirl, Team Flash is back in Central City and ready to get back to the Cicada business. Unfortunately, they have no idea where he is. They could track the dark matter in his dagger, but it only registers when he uses it, which he hasn’t been doing. Luckily for us, there’s never a dull day for these superheroes. The episode starts off with Nora speaking with Eobard Thawne in 2049 in Iron Heights prison. She’s angry after learning that he killed her grandmother when her dad was just a boy. He admits to doing bad things but said that he is trying to help her now. We learn that he is the one who taught her how to time travel in the first place. After learning about what he did, she no longer wants his help. District Attorney Cecile is back from maternity leave and her first case is to prosecute Mark Mardon’s daughter Joss, who we saw in episode seven, “O Come, All Ye Thankful.” She seems raring to go, but every time she looks at Joss, her words falter. Iris, Barry, and Nora are concerned, but she assures them she is okay. Nearby, a woman watches the trial on her phone before using what appears to be a meta-key fob to steal a Lamborghini. (Nice choice!) Considering she steals it right in front of the owner and a cop, a high-speed chase ensues. Barry gets the call to go after it, but he’s in court with Cecile as her lead CSI witness. He says there is no way the cops will be able to catch up with her in that car, but promises to be back within thirty minutes to give his testimony. Gabrielle Walsh plays Raya Van Zandt, a.k.a. Silver Ghost, a former military pilot with a meta key fob. Image courtesy of The CW. Barry and Nora chase after the Lamborghini. The plan is for Barry to grab the driver while Nora takes the wheel. Should be easy enough, he’s done this before. This time, however, when he attempts to reach through the door, he gets blasted back. The woman seems to have known this was going to happen and smiles as she continues driving on. Nora checks on Barry and the blast seems to have an added side-effect. He can’t stop vibrating. They rush back to the lab with Nora canceling Barry’s vibrations with her own. If she stops, he could fall through the earth and die. Cisco and Caitlin decide to let him at least fall through the floor. Then he’ll be in the pipeline and the meta dampener will stop his powers so he can stop phasing. Thankfully, it’s all timed right and he lands in a cell. Caitlin (Danielle Panabaker) watches as Nora (Jessica Parker Kennedy) tries to keep Barry (Grant Gustin) from falling through the floor. Image courtesy of The CW. After a bit of research, they find out that the car was saturated in unstable dark matter and since he was phasing when he touched it, it caused him to become unstable on a cellular level. Unable to leave the cell until the unstable dark matter is all out of his system, he can’t make it back to Cecile to give testimony. Nora says that she could do it. Cecile allows it but makes Nora promise to follow her lead. She admits to Iris that she wants to pursue a lighter sentence for Joss than originally intended because she keeps feeling intense waves of remorse coming off her. It seems Cecile’s empath powers are affecting her work. As usual though, Nora can’t do as she’s told and, while on the stand, she goes off on a tangent about how Joss knew what she was doing and willfully endangered people. Her tirade leads to Joss standing up and admitting that she’s guilty and that she should pay for what she did. Cecile is not pleased. In the lab, Caitlin removes the last of the dagger shards from Cisco’s hands. While examining their effects, Cisco realizes that the shards weren’t just dampening his powers. They were removing them. Caitlin sees this as a chance to make a serum to use against Cicada, but Cisco sees it as a potential meta-cure. He says that it could give metas a second chance at a normal life, but she points out that not everyone wants a normal life. She did everything possible to get Killer Frost back after losing her. Some people appreciate the meta powers. When Joss is being transported back to the prison after the trial, the woman with the Lamborghini stops the armored truck that she is in. Using her meta-key fob, she shuts down the vehicle. Nothing works and the guards are trapped inside. She’s then able to release Joss from the back, but Joss has no idea who she is. Raya Van Zandt (Gabrielle Walsh) stops an armored truck carrying the prisoner she wants to free. Image courtesy of The CW. Somehow, despite everything in the truck shutting off, the dash cam kept going so S.T.A.R. Labs had a perfect shot of this woman’s face as she saluted the guards in the truck. Running that against the Department of Defense database, they find out that she is Raya Van Zandt, a former Air Force pilot, mechanic, and an expert in vehicle operations who was dishonorably discharged. Cisco bestows her new meta-name, Silver Ghost. Nora believes that Joss has to be involved and gets angry when Iris suggests that she might not be. Nora says that “bad people don’t change,” proving this has more to do with her anger at Eobard Thawne than it does Joss. Raya explains to Joss that she wants to get something from A.R.G.U.S. Their state-of-the-art security system can only be blown out by a billion joules of electricity, the kind of power a couple bolts of lightning could provide. Joss refuses to help her and says she couldn’t even if she wanted to because she doesn’t have her staff. She just wants to be brought back. Raya won’t take her back but does let her go, saying she needs to see for herself that people will think Joss is forever a criminal, just like her dad. Still trying to crack Nora’s code from her diary, Sherloque asks Barry about the language. When Barry emerged from the speed force, he was acting crazy and had been writing in that code. Once he was better, he had no idea what it meant. Gideon hadn’t even been able to translate it. Barry was still as clueless as ever. Without any other clues, Sherloque drops off a book for Barry to read while trapped in the cell. That book happens to be Uncaged Desire written by the Legend’s own Mick Rory under the pen name Rebecca Silver. Sherloque Wells (Tom Cavanaugh) gives Barry (Grant Gustin) and viewers a first look at the book written by the Legend team-member, Mick Rory. Joss is able to set off an alarm using weather equipment signaling a hurricane is in the area. She does it purposefully so that The Flash will show up. With him still in the cell, Nora goes to check it out. Joss says that she needs her help and that Raya is not her friend. She wants to turn herself in, but she asks Nora to vouch for the fact that she didn’t escape but was taken against her will and that she’s coming back willingly. Lying, Nora agrees but then turns her over as an escaped criminal. Iris happens to be there and sees Joss yelling that she was turning herself in and that Nora was supposed to tell them. Nora refuses, saying that she doesn’t trust criminals. Iris shows Nora the classified military file on Raya that she called in a favor to get. It appears that she had a spotless record, but due to a failed mission, she was used as the scapegoat. Iris explains that not everyone is as bad as they seem and that most people deserve a second chance. Cisco begins the process of distilling dark matter from the shards that Caitlin pulled from his hands. His plan is ruined when Killer Frost blasts it all away. She says that Cicada is in his head, but he denies it. He wants a wife and a kid and doesn’t want that family to wonder if he’s okay or even going to be coming home when he’s called to fight meta-humans. He doesn’t want to be Vibe anymore. He just wants to be Cisco. Nora goes to have a heart-to-heart with her dad about bad people staying bad. He uses Leonard Snart as an example of someone he never thought would change, but who ended up being an ally and a Legend. Getting to the heart of the matter, she asks about Eobard Thawne. He says that part of being a hero is seeing the good in people and that maybe, someday in the future, even Thawne could change for the good. At the CCPD lockup, Raya creates a distraction and grabs Joss’ staff. She releases her from the cell, offering her a second chance. Having been denied that by Nora, she accepts. Using her staff, she calls up a lightning storm and is able to knock out the security system of A.R.G.U.S. It turns out what Raya wants to steal is a twenty-four million dollar prototype stealth car. Rumor says everything under its hood came directly from Wayne Tech. Perhaps this a batmobile-esque car. Nora goes after them and stops them in an alley, telling Joss that she needs to talk to her. Raya answers for her by firing a missile. Nora almost rolls her eyes as she easily dodges the projectile, but is shocked when it explodes directly in front of her. Turns out the car also provides remote detonation. Nora (Jessica Parker Kennedy) gets surprised by missile getting remote detonated in her face. Image courtesy of The CW. Killer Frost is up next with a thick icy wall, but the car has even more tricks. It has a phasing ability, allowing it and the passengers to easily pass through it. Joss is starting to get worried, but Raya isn’t. She puts the car in stealth mode and it goes completely invisible. By Cisco boosting a radio signal from Nora, the car is able to pick it up. She tells Joss that she should have given her the second chance she asked for and reminds her that being a criminal isn’t who she is. Raya intends to run her over, but Joss covertly uses her weather staff to ice the road, causing Raya to lose control. With the car crashed, it seems they are caught. Instead of turning themselves in though, Joss uses her staff and they escape via her magic lightning powers. Caitlin has a change of heart after hearing about Cisco’s desire to remove his own powers. She takes him to her dad’s old lab. Since her dad created a meta-gene, she thought maybe Cisco could use the research there to do the reverse. With Caitlin helping him, she says they need to have rules. The first and most important is that they will never force a cure on anyone. Cisco agrees. What could this countdown mean for Eobard Thawne? Image courtesy of The CW. Sherloque goes to the hidden room to speak to Gideon. He asks to see all the files on Nora, but Gideon tells him that she can’t because all the files were deleted by Nora herself. The plot thickens and Sherloque can’t help but follow the mystery. It looks like Cicada returns next week and he’s out for blood, taking out metas left and right, including Nora. Barry is going to have to keep himself under control. Cecile points out that if Barry lets that anger of someone hurting his child consume him, he’ll be just like Orlin Dwyer. Looks to be an action-packed episode! Take a look. Nickelodeon Releases the First Trailer for the “Legends of the Hidden Temple” Movie!